Spirited Away is without a doubt the best animated feature around. I'm finding these days that the good old Manga animations, I mean the really good ones are all becoming homogenously long series that cost you an arm and a leg to own, or at least half your yearly wage; the other problem with a fair few Manga movies is the complexity of the story and the need to watch it over and over just to know what�s going on. What Manga creators need to do is take a page from Spirited Away, the story is simple to follow, and you don't need to have a degree to know what�s going on and you only have to watch it once to understand the full story with all its ins and outs. The great thing about Spirited Away is that the animation is top of the line and the story is so imaginative you will be dumbfounded; the sound quality throughout the movie is absolutely fantastic, and both sound and picture quality is clear and the effects are so realistic and invigorating that Spirited Away will be elevated to the greatest animated film you have ever seen. The story follows a young girl and her parents, they have just recently moved to a new house and on the way the young girl�s father thinks he has found a short cut to their hill top country house when they find a small abandoned temple type looking building. When the family enters the building they find that it is actually a passage, but what they don�t know is that it is a passage to another world, or suppose you could call it another dimension. Initially the father thinks that the place they have entered is an amusement park that has been abandoned, but soon after they arrive the father picks up a scent; a fantastically yummy smelling food, the family follows the smell, all the time Chihiro, the daughter pleading to leave as it doesn�t feel right. As soon as the family finds the food that is being prepared the adults begin to stuff their faces with the food, Chihiro being upset and uneasy about the whole situation decides not to eat, but her father assures her there is no problem even though no one is selling or guarding the food, �Don�t worry father has plenty of money, and credit cards� Chihiro still doesn�t eat, her suspicions are too great. Chihiro leaves her parents to go and explore, but when she arrives at a bridge she is met by a young boy, looking upon her he realizes that she is a human, shouting at her �You�ve got to get out of here they are coming� just then as night falls dark shadows begin to appear and then slowly take shape, when Chihiro gets back to her parents they have been turned into pigs by their gluttony, literally. Chihiro tries desperately to run to the place where they entered the world but when she gets just outside the city the rock bed that they had crossed earlier has now been filled with water and is now a large straight between the island city and the main land. Now Chihiro must find a way back to her own world and the young boy, Haku has just found her crouching behind a building, �You must go to the bath house and ask for a job� or you will surely die or be captured", Haku instructs Chihiro to go to the bath house and see the boiler about a job; what Chihiro doesn�t realize is that the owner of the bath house is some sort of witch and when you sign a contract for a job there she steals your name for herself and you are from then on her slave. Chihiro must now find a way to help herself and Haku to get away from the witch and save her parents, but to do so Haku must figure out his name to escape the witch�s direct control. Chihiro has now been thrown into a world of spirits, the bath house is a business that the witch runs to service and relax the hard working spirits of world, these spirits work all day and when they catch the ferry home each night back to the city, some more important and hard working spirits need to relax more often, and the bath house is the one place they can do it. When Chihiro is working one day she sees a figure out in the rain, thinking the spirit is a customer that has been left outside she leaves the door open for him to enter, what she doesn�t realize is that the spirit is very kind hearted and only wants to help her, but upon entering the bath house the magics that protect the establishment make the spirit known as No Face go a little crazy, eating people and giving out tremendous amounts of gold to anyone who brings him food, though when he follows Chihiro out of the building later on he is released from the madness. This takes Haku and Chihiro on a roller coaster ride of excitement and intrigue, a new world for Chihiro and a world that Haku has been a part of for far too long. I guarantee that you will enjoy this movie, the story is well presented and I�m sure that that is the reason why it is so critically acclaimed, Spirited Away has won many awards since its release and I have no doubt at all that it deserved every single one; if not more. Spirited Away is without a doubt the best Manga film for all ages, everyone can enjoy Spirited Away not just the die hard Manga fans, don�t miss out, the movie that no DVD collection would be complete without. The nice thing is that with the limited edition, there is also a plethora of extras on the second disc to keep you going way past the excitement of the main feature. 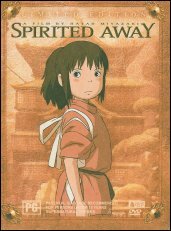 For the most part these are to be read out (such as the Themes of Spirited Away), however they are easy to read and really give you a look at where they are coming from in the film. The entire package is absolutely gorgeous and a must MUST have disc in the collections of all DVD owners.